The preliminary results for the world-first clinical trial on the efficacy of the 'What's the Buzz? Social and Emotional Literacy program' have now been collated and evaluated. The trial ran for the first 6 months of 2018 and 2,000 school students aged from 4 to 10 years of age, educators and parents took part. Feedback was sought from each group. Experimental and control groups were compared, and all 16 lessons from the EARLY LEARNER's program were used. 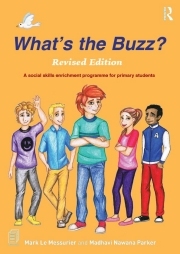 Teachers scored students higher in self-awareness, relationship skills and responsible decision making after completing a 'What's the Buzz?' group compared to those students in the control group who did not participate in a 'What's the Buzz? program. Furthermore, the improvement in responsible decision making was statistically significant. At this time (December 2019), the results from parents and students are still being evaluated, although the early indications look just as strong as the teacher feedback. 'What's the Buzz?' can now be considered as a rigorously evaluated evidenced based program. 'What's the Buzz? with Teenagers' (ages 11 to 15 years) remains due for release in March 2019. It is now with Routledge, our publishers. It is a deep resource so that each chapter can revisited 4, 5 or 6 times with students. Each lesson begins with an Archie story and Archie will be about 13 years old. There will be 10 chapters in the book and an additional 6 online. 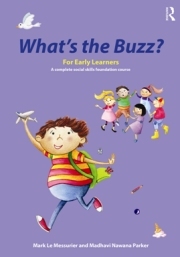 Currently we are writing a second edition of 'What's the Buzz?' for PRIMARY STUDENTS (ages 9 to 11 years). We're working on it with great enthusiasm and haste! It will be a 50% rewrite and each of the 16 lessons will also have an Archie story in them for the first time. Archie will be about 11 years old, and this book will be released early in May 2019. This is a comprehensive RESOURCE BOOK with 10 Chapters. The wide-ranging content means educators can revisit each lesson 4 or 5 times while staying with the same theme. A further 6 chapters will be available online. Welcome to What's the Buzz? a complete social and emotional literacy approach comprised of 48 lessons over 3 programs and complimented by a deep selection of online resources. What's the Buzz? is an evidence-based program now used in more than 130 countries to teach young people social and emotional intelligence. It is based on the S.A.F.E. criteria, which permits maximum opportunity for the skills taught to transfer across into other situations. The program has become a required text for teachers, counsellors, psychologists, social work and youth workers in training at many Universities worldwide. The EARLY LEARNER's program was launched in 2015 to immerse younger students in a variety of essential interpersonal skills, stimulated by the experiences of a character called Archie. In each lesson, the children help Archie solve the very same social dilemmas that occur in their everyday lives. As they do this, through activity, discussion, role-play, games, puzzles and quizzes, they learn how-to express feelings and become a more positive problem solver. 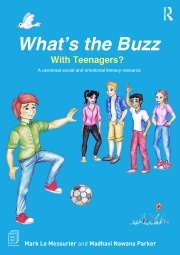 The first version was first released in 2011 for teachers, school support workers, parents, home schoolers, and a range of allied health professionals, to awaken the social and emotional awareness in youngsters. It quickly became a global phenomenon finding its way into scores of countries, hundreds of schools, charities, government welfare organisations and the private practices of allied health professionals. In 2019 we wrote a revised version containing a new Archie story in each chapter. While Archie's exact age is never revealed, he's about 11 years, and faces the same social and emotional challenges that children around this age typically encounter. Published in 2019 this is a deep social and emotional teaching resource that has been well received. In fact, each chapter can be revisited 3, 4 or 5 times with students. Lessons begins with a classic Archie story. Archie is about 13 or 14 years old and faces social and emotional issues with the complexities typical for this age group. There are 10 chapters in the book and an additional 6 online. This version is aimed at middle school aged students and has application in schools and in private practices with allied health professionals. And while absorbed in this skill-building, we give children the chance to grow steadier emotions and better behaviours. Teaching social and emotional literacy, continuously, is a highly effective way to benefit our relationship with, and between, students. All human beings, no matter their age or circumstance, profit from being methodically taught social and emotional literacy skills and being in an environment where these are nurtured. We now know that when young people are unable to attach to peers or feel isolated, they are more likely to be at risk from behavioural turbulence, mental health difficulties and have a greater tendency for future anti-social behaviour.